jefff 1 year, 9 months ago. Here comes the LineageOS 14.1 for Redmi Note 3 Pro via an unofficial build. If you want the OFFICIAL update or some more Lineage ROMs then stay tuned to the LineageOS 14.1 ROM collection page. This Redmi Note 3 Pro (kate) Lineage OS 14.1 is brought to you by developer amjads. THIS IS AN INITIAL BUILD WHICH MAY NOT BOOT AT ALL OR EVEN IF IT BOOTS IT MAY HAVE MANY BUGS. HAVE A BACKUP OF THE CURRENT ROM BEFORE FLASHING THIS ROM AND TRY AT YOUR OWN RISK. Installing a custom ROM on a Redmi Note 3 Pro (kate) requires the bootloader to be unlocked on the Redmi Note 3 Pro (kate) phone, which may VOID your warranty and may delete all your data. Before proceeding further you may consider backup all data on the phone. You are the only person doing changes to your phone and I cannot be held responsible for the mistakes done by you. Download and Copy the GApps and LineageOS 14.1 for Redmi Note 3 Pro ROM ZIP to your phone. First flash the Redmi Note 3 Pro Lineage OS 14.1 ROM ZIP from device. Then flash the GApps zip from your device memory. Reboot and Enjoy the Nougat 7.1 Lineage OS 14.1 ROM for Redmi Note 3 Pro (kate). Copy the latest Lineage OS 14.1 for Redmi Note 3 Pro ROM ZIP file to your phone. Stay tuned or Subscribe to the Redmi Note 3 Pro (kate) forum For other Android Nougat ROMs, LineageOS 14.1 ROMs, other ROMs and all other device specific topics. Seems like that URL doesn’t exist. Or at least we can’t seem to find it. We’ve even looked under the seat cushions and zip, nada, nothing. @kateuser Added a new link for this Lineage OS ROM. Thank you very much for new version of lineage kate rom! Thank you developer amjads and @shibaa987 for bringing this version! Works flawlessly! 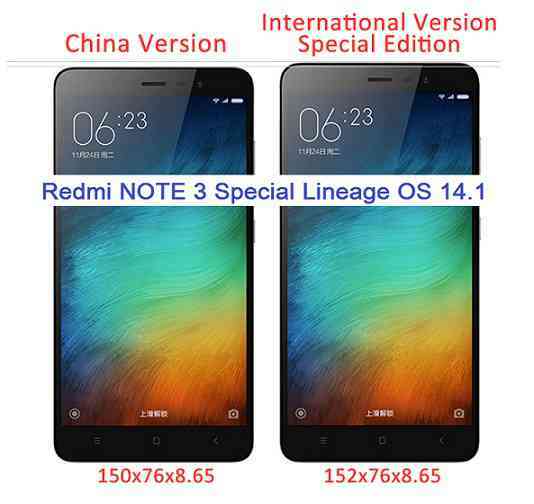 When will we get an offical Lineage OS 14.1 for Redmi NOTE 3 Special? Yes, really good rom, i have had flashed the official kenzo on mine with kate radios, i tried this unofficial one and it seems work better. Will there be others updates? will it become official in the futur? I am not sure of the official Lineage OS updates because LineageOS team has some set of standards to be followed by the developer maintaining a device which is more tight in terms of quality of the ROM and also long term maintenance etc. Regarding the updates to amjads’ builds, I have updated a link to his build folder where you have new ROM updates waiting. The latest build from him when I was writing this reply was on date: 21st May. Could you give release notes for every version of the ROM? I want to contact amjads himself but no contact information found. Right now i’m using lineage-14.1-20170629-amjads-kate.zip, and today i see that there is update lineage-14.1-20170708-amjads-kate.zip. I wanna know what’s updated on the new version before flashing it.